Tower Hamlets council, North London; caused respectively by the resignations of Labour councillors Muhammad Harun and Ruhul Amin. Both of them had served only since May 2018. We start this week by paying tribute to a party leader of years gone by, and one to whom your columnist personally has cause to be very grateful. Allow me to explain. In the summer of 2008 a new quiz programme turned up on BBC2, broadcast in the early evening slot now normally occupied by Eggheads. It was called Battle of the Brains, and featured teams of six players (plus a non-playing captain) being whittled down over a series of head-to-head challenges. The rounds were varied in format; one was a list round, where players would alternate in giving answers from a certain list (winners of the Oscar for Best Picture, say) and the first to fail loses. I idly looked at this programme and started thinking of possible lists that might be worth learning (list-learning is an important skill in quiz). Leaders of the Labour Party seemed a good shout – a list that’s long enough to be interesting but short enough to be manageable. I had a look at the list and started memorising some possible killer answers. As they say in the Scouts, “Be Prepared”. Fast forward to the Tuesday of the week before Christmas 2008. Having been out all day at work and out all evening in the pub playing quiz league, I arrived back home rather after Last Orders to find some panicked messages. 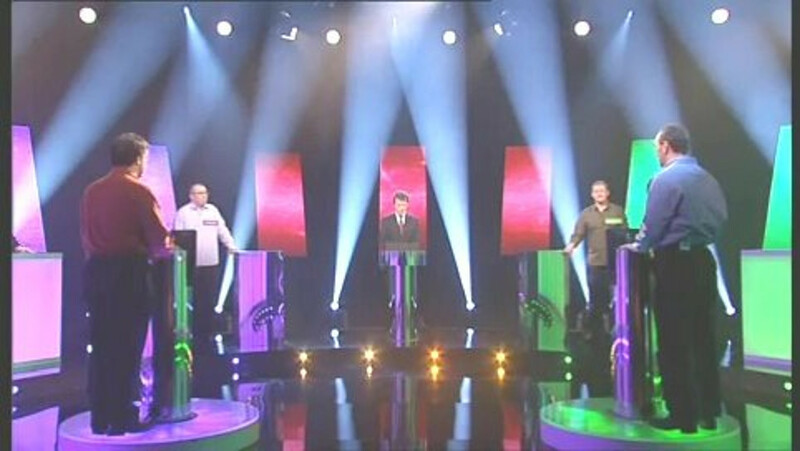 A team of friends had been accepted onto the second series of Battle of the Brains but one of them had had to drop out. Could I play instead? Oh, and we’re recording on Thursday evening. Naturally I said yes. And so less then 48 hours later I found myself on the stage (far left in the picture) at Granada Studios in Manchester answering quiz questions from Nicky Campbell (centre). It was an intense and memorable time from which many experiences stand out. One of my fellow team members initially mistook me for a researcher because I’d turned up straight from a ten-hour day in work with security passes and everything. A well-known member of the quiz community ran out of interesting facts to say about himself and so lied through his teeth on national television about training as a lion-tamer. A sudden-death elimination round had to be decided on the buzzer after the production team ran out of questions. A Mastermind champion on our team lost every one of his head-to-head challenges. In one of my head-to-head rounds I was sent up to do the list round on the subject of “Politics”. To my surprise and delight, the list proved to be “Leaders of the Labour Party” (excluding acting or temporary leaders). My opponent was also knowledgeable, and after eight answers we were both still in there and it was my turn. By this point we’d picked off every postwar leader except Hugh Gaitskell, who I was struggling to remember, and Gordon Brown; Brown was leading the party at the time and I was wary of answering him, because I couldn’t remember whether the question had had the word “former” in it. It was time to play my first killer answer. I said “George Lansbury”. My opponent had no reply, and that was the end of that. We ended up doing four shows over two days of recordings, and on the second of those defeated a team of Yorkshire County Cricket Club staff (captained by the then Yorkshire captain and former England test cricketer Anthony McGrath, second from right in the picture) to win the jackpot of £7,000. My £1,000 share of the prize changed my life, in that it finally cleared my student credit card debt. Yes, even decades after his death, George Lansbury still has the power to improve lives, as he did for many people in his own lifetime. A Londoner virtually all his life, Lansbury was a radical socialist whose policies – such as pacifism – were often out of the mainstream within his own party. Sound familiar? Lansbury started off in politics on the radical wing of the Liberals; he was the party’s election agent in Whitechapel at the 1885 general election, and in the inaugural London County Council election of 1889 was the agent for Jane Cobden (daughter of the radical Richard Cobden) as she was elected for Bow and Bromley, becoming one of the first women county councillors. Not that it did her much good; Miss Cobden was the subject of legal challenges over whether she was qualified to be a councillor on account of being a woman, and ended up being prevented from speaking or voting in the council chamber on pain of financial penalties. Lansbury was a strong supporter of women’s suffrage, going so far as to resign his seat in Parliament in 1912 and fight a by-election on that single issue; he lost. By 1912 Lansbury was on the ladder of elective office, having become a Poor Law guardian for Poplar in 1893. He was elected to Poplar borough council ten years later. In 1910 he was elected to the London County Council and won the Bow and Bromley parliamentary seat in December of that year; after losing his Parliamentary seat in the by-election two years later Lansbury ended up as editor of the Daily Herald, which may be the forerunner of the modern-day Sun but in those times was a very left-wing paper. In the 1919 local elections the Labour party gained control of Poplar borough council and George Lansbury became the first Labour mayor of the borough. Poplar was a poor borough in the East End, running from Bow in the north to the docks on the north bank of the Thames; many of the borough councillors were industrial workers. The Labour administration set up a comprehensive and expensive programme of poor relief, which included such radical ideas as equal pay for women and a living wage for council workers. It was too much for Poplar’s rates to support, and in 1921 Lansbury and his fellow councillors decided to make a stand by withholding the rate precepts due to the London County Council, the Metropolitan Police and other such bodies. That got thirty of the borough councillors sent to jail for contempt of court, including Lansbury, his son Edgar and his daughter-in-law Minnie (who developed pneumonia while in prison and died shortly afterwards). With farcical scenes of Poplar council meetings taking place in Brixton prison (to which the women councillors were taken by taxi from Holloway) and several other Labour councils threatening to go down the same road, the Lloyd George government caved in after six weeks and rushed a bill through Parliament to equalise the tax burden between rich and poor boroughs. It was a victory for the Poplar Rates Rebellion: the borough was a huge winner from the equalisation, the council was able to cut its rates by a third while seeing greatly increased revenues, and in the general election the following year George Lansbury was returned to Parliament with a huge majority in Bow and Bromley. Lansbury turned down a junior ministerial post in the 1924 Macdonald government, but in 1929 entered Cabinet as the First Commissioner of Works. One of the more junior cabinet posts, this gave him responsibility for historic buildings and the Royal Parks, and a lasting legacy of Lansbury’s tenure in Cabinet is the Hyde Park Lido in the Serpentine lake. The second Macdonald government was derailed by the Wall Street crash and the Great Depression, and the 1931 election was a notorious disaster for Labour which ended up with just 46 seats. One of the many Labour MPs who found themselves out of the Commons was the party leader Arthur Henderson, and George Lansbury became leader of the Parliamentary Labour Party as pretty much the only senior figure remaining from the wreckage. Henderson resigned as overall party leader the following year and Lansbury succeeded him in the top job. By now George Lansbury’s major political cause was pacifism. This was all the rage when he became party leader – within a few months the Oxford Union was voting not to fight for King and Country – but the rise of Hitler and Mussolini made that policy untenable. Lansbury was defeated at the 1935 Labour conference on a motion calling for sanctions against Italy, and resigned as party leader. He was re-elected to Parliament for the final time at the general election the following month, and served a second term as Mayor of Poplar in 1936-37 while his daughter Dorothy Thurtle was serving as Mayor of Shoreditch. George Lansbury died in May 1940, aged 81, from undiagnosed stomach cancer; he was cremated, and his ashes were scattered at sea. Shortly afterwards his home, at 39 Bow Road, was destroyed by enemy bombing in the war he had worked so hard to prevent. George Lansbury and the Poplar Rates Revolt left us some surprising legacies. The death of Minnie Lansbury led her husband Edgar to remarry; his second wife Moyna Macgill was a noted actress, and her daughter with Edgar is an even more noted actress. Dame Angela Lansbury, George Lansbury’s granddaughter, is still with us and still working at the age of 93 (her latest film, Mary Poppins Returns, came out last December). Moyna Macgill’s other children were also involved in showbusiness: her sons Edgar Lansbury junior and Bruce Lansbury became Broadway producers, while her daughter from a previous marriage Isolde Denham was married to Peter Ustinov for a time. Another of George Lansbury’s grandchildren made a huge impact on a generation of British children; George’s daughter and secretary Daisy married a left-wing historian called Raymond Postgate, and their son Oliver Postgate gave us such classics of children’s television as Ivor the Engine and, of course, Bagpuss. But one of the major modern legacies of George Lansbury didn’t directly have anything to do with him but was simply named in his honour. The Lansbury Estate was built in 1951 as part of the Festival of Britain, on a heavily-bombed triangular site between the Limehouse Cut canal, the East India Dock Road and a railway line. It was part of the Festival’s architecture exhibits, and some of its buildings are now listed. The design was intended to be a self-contained community with its own pubs, churches and market – Chrisp Street Market, which is claimed to be the UK’s first purpose-built pedestrian shopping area. The railway line closed some years ago but reopened in 1987 as part of the Docklands Light Railway; a station to serve the Lansbury estate, Langdon Park, was opened in 2007 and now serves nearly four million passengers each year. Since 2014 the Lansbury estate has anchored the Lansbury ward of Tower Hamlets. The DLR links Lansbury ward (with a change at Poplar) to central London with stations at Bank and Tower Gateway, and the last stop before those termini is Shadwell. This area was first seriously developed in the seventeenth century through the auspices of Thomas Neale. One of the major figures of England in the late Stuart era, Neale was a long-serving Member of Parliament, effective postmaster-general in the North American colonies, Master of the Royal Mint until his death in 1699 (after which Isaac Newton got the job) and inveterate property developer and entrepreneur. Shadwell’s proximity to the City of London made it an attractive maritime centre: the local St Paul’s church has seventy-five ship’s captains buried in its churchyard, and Captain James Cook’s son was baptised there. 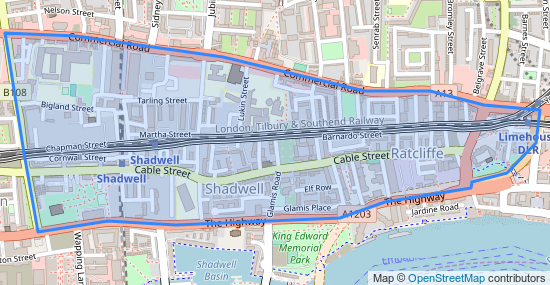 However, the modern Shadwell ward contains little of the historical Shadwell area, which ended at The Highway; instead Shadwell ward runs between The Highway and Commercial Road. The main original landmark here was the eighteenth-century church of St George-in-the-East, which gave its name to a parliamentary constituency from 1885 to 1918; the main modern thoroughfare is Cable Street, which took its name from the maritime industries (it was a ropemaking centre). In October 1936 Oswald Mosley had intended to lead a fascist march towards Stepney down that road; this was blocked by protesters and eventually abandoned in what became known as the Battle of Cable Street. The ward extends to the east through the Ratcliffe area as far as the railway and DLR stations at Limehouse. Shadwell had one of Britain’s first significant Muslim populations thanks to settlement of lascar seamen, who had come here as crewmembers on the East India Company’s ships. So it’s appropriate that Tower Hamlets more generally is one of the UK’s major centres for immigration from Bangladesh in particular. 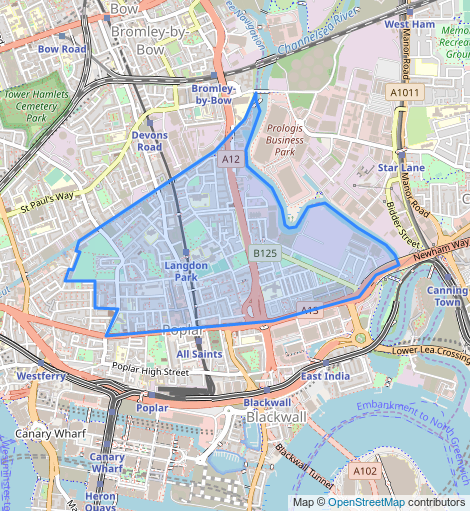 In the 2011 census Shadwell ward (which then had slightly different boundaries) made the top 100 wards in England and Wales for Islam (47%), Asian ethnicity (52%) and those looking after home or family (8.75%). Lansbury ward, despite the best efforts of the man it’s named after, remains a very poor area: eight years ago the census return for the predecessor ward of East India and Lansbury made the top 100 lists for social renting (57%), looking after home or family (10%), unemployment (10%), Islam (43%) and under-16s (28%). Lansbury might also be perplexed by the modern politics of Tower Hamlets, which is Byzantine. Or whatever the Bangladeshi equivalent of Byzantine is. Limehouse was of course the birthplace of the Social Democratic Party, and the SDP and their successors controlled Tower Hamlets council from 1986 to 1994. Labour were returned with a large majority in the 1994 election, but indications that all was not well can probably be seen from the landslide general election result of 1997 in which Bethnal Green and Bow was one of only two constituencies to swing towards the Conservatives. Things started to fall apart in the 2002-06 term, in which Labour lost by-elections on the council to the Conservatives (thanks to gentrification in the Isle of Dogs and riverfront areas) and to George Galloway’s Respect party, which topped the poll across the borough in the 2004 European Parliament elections. The following year Respect’s George Galloway won the Bethnal Green and Bow constituency, gaining it from Labour; and in 2006 Respect became the official opposition on Tower Hamlets council. The Respect spasm was shortlived and by 2008 many of its councillors had joined the Labour group. This had the effect of exacerbating already-bitter infighting within Tower Hamlets Labour, whose divisions echoed and reflected those thousands of miles away in Bangladesh between Jamaat-e-Islami and the Awami League. The balance of power within the group changed, and Labour’s Lutfur Rahman took over as leader of the council. His tenure as leader was very controversial, with negative press coverage concentrating on the effective sacking of the chief executive combined with allegations – which have never been proven – that Rahman had links with extremist Islamists. So it was probably a relief for Labour at a regional level when the 2010 elections resulted in a recovery of the Bethnal Green and Bow parliamentary seat, plus an increased Labour group with an anti-Rahman majority. That relief was however short-lived, because the voters of Tower Hamlets also passed by referendum a proposal for an elected mayor, and Rahman sought the Labour mayoral nomination. When he was blocked from getting it, he stood for mayor as an independent candidate, and won the October 2010 Tower Hamlets mayoral election in the first round. As mayor, Lutfur Rahman attracted a number of councillors to his banner. Many of them were defectors from Labour; all of them were from the Bangladeshi community. They organised into a party – Tower Hamlets First – whose sole purpose was to support Rahman. His mayoral term was marred by corruption; central government sent in commissioners to take over council grant allocation, but that was as nothing compared to what was to come in May 2014. The 2014 Tower Hamlets elections returned Rahman as mayor and a hung council, with Tower Hamlets First’s eighteen councillors opposed by 22 Labour members and five Conservatives. The Election Court described those elections as “generally corrupt” and I have no qualms in repeating that judgment. The Court found that Lutfur Rahman, through his election agent Alibor Choudhury, had falsely and knowingly labelled Labour’s mayoral candidate John Biggs as racist; the council’s grant allocation (before the commissioners took over) had been politically motivated and amounted to bribery; the council had improperly paid the local Bengali-language media to portray Rahman favourably; four Tower Hamlets First candidates had cast votes unlawfully after making false entries on the electoral register; and there was evidence of postal vote fraud. But the most sensational allegation upheld by the court was that Lutfur Rahman had improperly played the religion card, by getting the local Muslim leaders to send messages to their congregations that it was the religious duty of Muslims in the borough to vote for Rahman. That offence – undue spiritual influence – had not been invoked since the nineteenth century. Possibly even more disturbing was that the Court decided that allegations of intimidation at polling stations by Tower Hamlets First supporters were not an offence under electoral law. 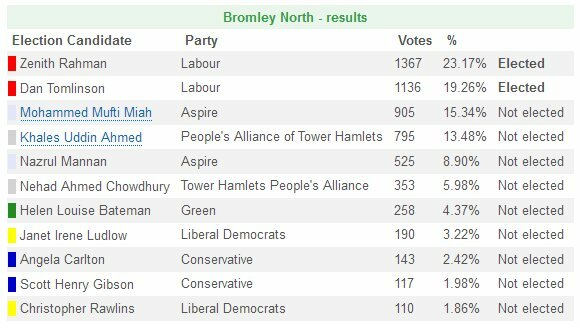 To cap it all, the 2014 Tower Hamlets count was a notoriously incompetent fiasco: the final result, for Bromley South ward, took 118 hours to declare. The retribution in this twenty-first-century rotten borough is still playing out. The initial consequence was that Lutfur Rahman was disqualified as mayor, as was his election agent Alibor Choudhury; both of them remain disqualified from office and struck off the electoral register. Rahman has since gone bankrupt and been struck off the roll of solicitors, and has been the subject of further court action related to the costs of the trial. His deputy mayor, Oliur Rahman (no relation) was quickly forced to resign the post because of a conflict with his civil service job. Tower Hamlets First was struck off the register of political parties after the trial revealed that it wasn’t being run according to law – most notably, it had never had a bank account. The mayoral by-election in June 2015, and the by-election in Stepney Green ward to replace Alibor Choudhury, were both gained by Labour. And there were consequences for Shahed Ali, a Lutfurite councillor whom the trial revealed to have been registered to vote at two different addresses and who had cast two votes at the 2014 elections; one of those addresses was a council flat, and Ali was subsequently sentenced to five months’ imprisonment for housing fraud against his own council. The resulting by-election, in December 2016 for Whitechapel ward, returned another Lutfurite independent. By the May 2018 election the Lutfurites were in disarray, having split into two factions: the moderate People’s Alliance of Tower Hamlets headed by Rabina Khan, who had been the Lutfurite candidate in the 2015 mayoral by-election, and the more hardline Aspire party headed by Lutfur’s former deputy mayor Ohid Ahmed. Both parties contested the 2018 election. Splitters! As can be seen the effect across the borough was to split the Lutfurite vote; England’s first-past-the-post electoral system makes this a bad idea, and the Lutfurites were all but wiped out. John Biggs was re-elected as Labour’s mayor, easily defeating Rabina Khan in the run-off, and the Labour party won 42 out of 45 seats on the council. The Conservatives held two, and the remaining councillor was Rabina Khan, re-elected at the top of the poll in Shadwell ward. Khan has since dissolved the People’s Alliance of Tower Hamlets, and she has joined the Liberal Democrats. Which makes things interesting given that one of today’s Tower Hamlets by-elections is for the other seat in Shadwell ward, with Labour defending. Outgoing councillor Ruhul Amin, who was first elected in May last year, is moving to Bangladesh. The circumstances of the other by-election are more controversial: Muhammad HM Harun, who was also first elected in May last year for Lansbury ward, resigned under a cloud amid allegations of housing fraud. One of the outgoing councillors from whom Harun gained his seat was none other than the Aspire leader Ohid Ahmed. So this is an interesting test for both sides of the former Lutfurite faction. In 2014 Lansbury ward returned two Labour councillors and one from Tower Hamlets First (Ohid Ahmed); Labour won all three seats last year with 36%, to 24% for Ahmed’s Aspire, 12% for the People’s Alliance of Tower Hamlets and 9% for the Liberal Democrats. Shadwell voted Tower Hamlets First in 2014; in 2018 Rabina Khan was re-elected for the People’s Alliance of Tower Hamlets with 34% of the vote, to 27% for Labour who won the other seat, and 21% for Aspire. Results without a Lutfurite or two on the ballot are probably not that relevant here; but for the record, in 2016 Sadiq Khan beat Zac Goldsmith 66-13 in Lansbury and polled 73% in Shadwell, while in the London Members ballot Labour led the Tories by 64-9 in Lansbury and polled 68% in Shadwell. As if it wasn’t difficult enough for Labour to defend the Shadwell by-election, their candidate Asik Rahman has attracted controversy during the campaign over Facebook likes for the pages of two hate preachers. With the dissolution of the Peoples Alliance of Tower Hamlets we might take the Liberal Democrats to be the major challengers now in the birthplace of the SDP: although the Lib Dems finished last here in May 2018 with 4% of the vote, they have selected a strong candidate in Abjol Miah, who was a Respect councillor for the former Shadwell ward from 2006 to 2010 and later a Tower Hamlets First councillor for St Peter’s ward from 2014 to 2018. Miah was the Respect candidate for Bethnal Green and Bow in the 2010 general election, losing the seat which George Galloway had won five years earlier. Mind, Abjol has had social-media-related problems of his own in the campaign after it was revealed that he’d shared on Twitter a video of antisemitic conspiracy theories. Or we might take Aspire to be the major challengers; they have selected Harun Miah who was Rabina Khan’s ward colleague here from 2010 to 2018. Completing the Shadwell ballot paper are independent candidate Kazi Gous-Miah, who fought the ward last year; Tim Kiely for the Green Party; Daryl Stafford for the Conservatives and Elena Scherbatykh for the Women’s Equality Party. The Labour defence in Lansbury ward is led by Rajib Ahmed, who represented this ward and its predecessors on Tower Hamlets council from 1998 until 2018, and was Speaker (ceremonial mayor) of the borough in 2012-13. This could be a quick return for him. Also looking for a quick return is Ohid Ahmed, the Aspire candidate who lost his seat here last year. There is no People’s Alliance of Tower Hamlets candidate, but their mantle has been taken over by the Liberal Democrats who have selected Muhammad Abul (or Abdul) Asad; he was a Tower Hamlets councillor for 28 years until losing his seat in Whitechapel ward in 2018, serving as Mayor in 1998-99. Before joining the Lutfurite cause Asad had been a Labour figure, and he was on the Labour list for London in the 2009 European Parliament elections and the 2000 and 2004 London Assembly elections. Also standing are Mumshad Afruz for the Conservatives, John Urpeth for the Green Party, Paul Shea for UKIP and Terence McGrenera, who will be hoping for more than the 12 votes he polled in this ward in 2016 as the London Assembly candidate for the House Party. And remember: this is Tower Hamlets and strange things happen in Tower Hamlets politics. If you’ve got all the way to the end of this, hopefully you’ll have some killer answers for when the unexpected happens. Be Prepared. Lambeth council, South London; caused by the resignation of Labour councillor and chief whip Jane Edbrooke, who has a new job with the Big Lottery Fund which is politically restricted. She had served since May 2018 for this ward, and previously had been councillor for Oval ward since 2010. For our other London by-election we travel to another ward associated with a party leader, this time south of the river. Thornton ward lies on the South Circular road just to the north of Tooting Common; it’s based on the Hyde Farm estate, which was developed in and around the Edwardian era and remains mostly well-preserved; much of it is now a conservation area. Many of the houses on the estate are now owned by the E Hayes-Dashwood Foundation, which is named after the original architect and leases them to disabled ex-servicemen. 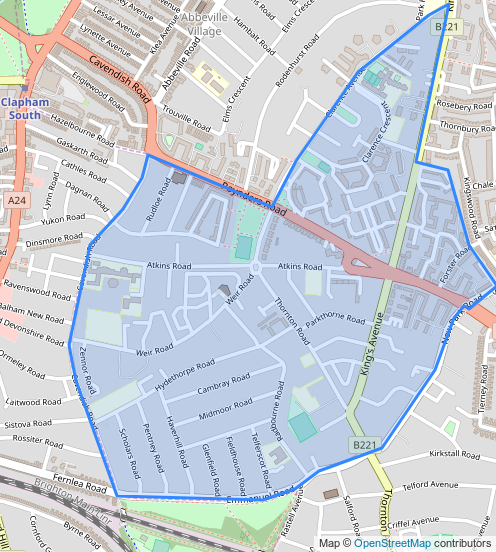 The ward has a large black population but also has high employment levels; perhaps a reflection of the fact that it borders Clapham which is going up the social scale very quickly. Thornton ward was contested in 1971 by a Tory councillor called John Major, who had been chairman of Lambeth’s housing committee; but the voters chose to reject the future Prime Minister in favour of the Labour slate. The current ward boundaries were introduced in 2002 when the Lib Dems won two out of three seats and were five votes away from a third; but since 2006 Thornton has voted Labour and is now very safe for the party; in May last year Labour led the Tories here 63-16. That was an improvement on the London Mayoral election two years earlier, where Sadiq Khan beat Zac Goldsmith in Thornton’s ballot boxes 58-25; in the London Members ballot Labour polled 50%, the Conservatives 23% and the Greens 11%. Thornton is in the Streatham constituency of Chuka Umunna, who is one of those people that those on the Leave side of the referendum debate and the Corbyn side of the Labour debate love to hate; so this by-election might well be watched closely. 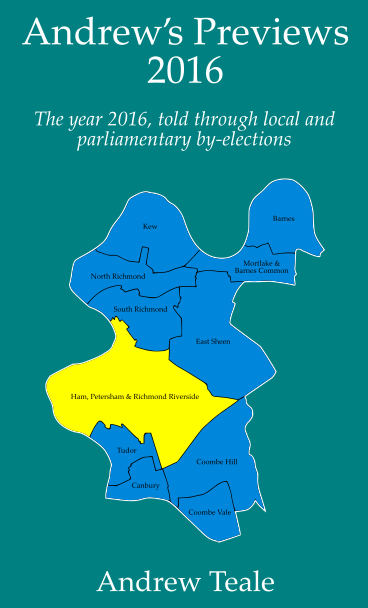 This will be the first in a two-part series of Thornton by-elections, as one of the other ward councillors – the outgoing leader of Lambeth council Lib Peck – has also recently resigned to take up a politically-restricted post. There will be another by-election for her seat in due course. Defending this by-election for Labour is Stephen Donnelly, a Scottish immigrant to London who fought St Leonard’s ward last year. The Conservatives have reselected Martin Read who was runner-up here in 2018. Also standing are Adrian Audsley for the Greens, Rebecca Macnair for the Liberal Democrats, Leila Fazal for the Women’s Equality Party and John Plume for UKIP. Wokingham council, Berkshire; caused by the resignation of Liberal Democrat councillor Helen Power on health grounds. She had served only since May 2018. We move out of London but stay in the Home Counties, starting in Berkshire. Evendons ward is the western of the four wards covering the town of Wokingham, a strangely unlovely town which seems to exist solely to provide houses for London commuters. Evendons is a case in point; over half of its residents are in management or professional occupations. This ward took on its current boundaries in 2004 and had been solidly Conservative up to 2016, when the Lib Dems suddenly got within range of winning. 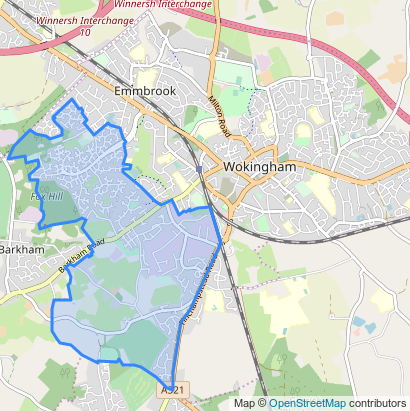 The party followed through in 2017 by winning a by-election in the neighbouring Emmbrook ward, and then the Lib Dems gained this ward in May last year by 47% to 41%. Unfortunately Helen Power, the new Lib Dem councillor, didn’t get a chance to build on that victory; she was diagnosed with terminal cancer shortly afterwards. The Conservatives are severely underperforming in Wokingham at the moment; this appears to be a reaction to a town centre redevelopment which is causing traffic chaos (although the end result surely can’t be much worse than the town centre Wokingham already has). Evendons is in the Wokingham constituency of John Redwood, who is one of those people that those on the Remain side of the referendum debate love to hate; so this by-election might well be watched closely. Defending for the Lib Dems is Sarah Kerr, a freelance pianist and music conductor who is unhappy with the new-look Wokingham town centre, believing that it’s unsafe for visually-impaired people. The Tories have gone for youth in selecting Daniel Clawson, a secondary school assistant headteacher. Completing a three-strong ballot paper is Labour’s Tim Lloyd. Buckinghamshire county council; caused by the death of Chaudhary Ditta, who had been elected for the East Wycombe Independents. For our final South East by-election we are in the Chiltern Hills. High Wycombe is an old market town in the valley of the River Wye, on the main road and one of the railway lines between London and Oxford. The town was once tightly packed into the valley, but the substandard housing on the valley floor has mostly been replaced by estates running up the valley sides. 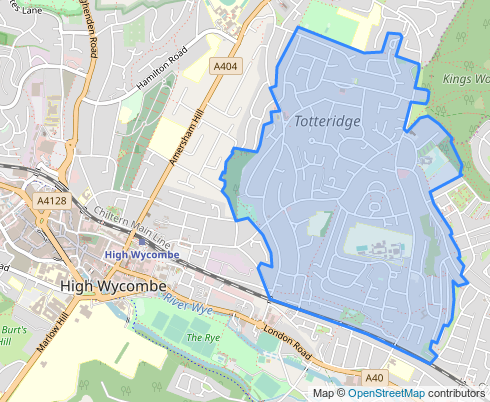 Totteridge and Bowerdean is such an area, lying to the east of High Wycombe town centre. This is an area which has seen immigration from Pakistan, particularly the Punjab, and the Bowerdean ward of Wycombe council (most of which is within this division) makes the top 100 Muslim wards in England and Wales. Chaudhary Ditta was one of those Pakistani immigrants, having been born in Kashmir; he came to High Wycombe in 1973. Ditta had represented this area on Buckinghamshire county council since 2005, initially being elected as a Labour figure before defecting to the Liberal Democrats in his first term. He was re-elected in 2009 and 2013 as a Lib Dem before breaking away from the party to join the East Wycombe Independents; Ditta was re-elected under that label in 2017 for his fourth and final term, polling 40% to 25% for Labour and 20% for the Conservatives. He had also been a Wycombe district councillor from 2003 to 2015 when he lost his seat in Bowerdean ward to Labour, and was weighed in as Mayor of High Wycombe in 2011-12. Totteridge, the other ward in the division, split its two seats between the Conservatives and the East Wycombe Independents in 2015. That 2015 poll is likely to be the last election to Wycombe district council, as local government in Buckinghamshire is due for reorganisation and the 2019 elections have been cancelled. The current plan is that in April 2020 a new single Buckinghamshire council will be created, to replace the current county council and four district councils. So Chaudhary Ditta’s successor may not get to serve for all that long. Defending for the East Wycombe Independents is Matt Knight, a Wycombe district councillor representing Micklefield ward; like Ditta, he’s a former Lib Dem figure. Labour have selected Israr Rashid. The Tory candidate is Richard Peters, a chartered engineer and charity volunteer. Completing the ballot paper is Ben Holkham for the Liberal Democrats. Bradford council, West Yorkshire; caused by the death of Labour councillor and former council leader Ian Greenwood at the age of 68. For the final poll of the week we travel from the frozen South to the North. Welcome to Bolton – not here the Greatest Town in the Known Universe, but a suburb of Bradford. This ward is immediately to the north of Bradford city centre, taking in the Undercliffe area to the south and the rather newer estates of Bolton to the north. Bolton is one of the pasts of Bradford which has been least changed by the Jewel’s transformation into a multicultural city, although its BAME population is still above average (particularly so in Undercliffe). The city’s ethnic diversity is mirrored by political diversity, with pretty much every party being capable of winning a ward in Bradford under the right conditions. One of those parties was George Galloway’s Respect. In early 2012 the health of Marsha Singh, Labour MP for Bradford West, failed forcing a by-election. That by-election was won by Galloway, and he followed up by organising a Respect slate to contest the May 2012 Bradford city elections. 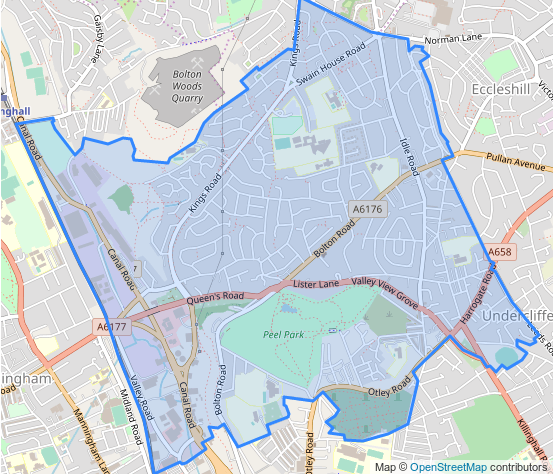 Respect won five wards, all in heavily-Asian areas; and one of those was Little Horton ward where the leader of the council, Labour’s Ian Greenwood, was defeated. The Respect spasm was shortlived and the party hasn’t won anything in Bradford since. Greenwood was by 2012 in his second period as council leader, and had served on Bradford council since 1995; he had previously been a West Yorkshire county councillor. In 2013 he was appointed OBE for services to local government, having by now become chairman of the Local Authorities Pensions Fund Forum; with local government pension funds being collectively worth over £230,000 million, that made him a big name in the pensions industry. The loss of the Bradford West by-election meant that just one of Bradford’s five parliamentary constituencies were in Labour hands. 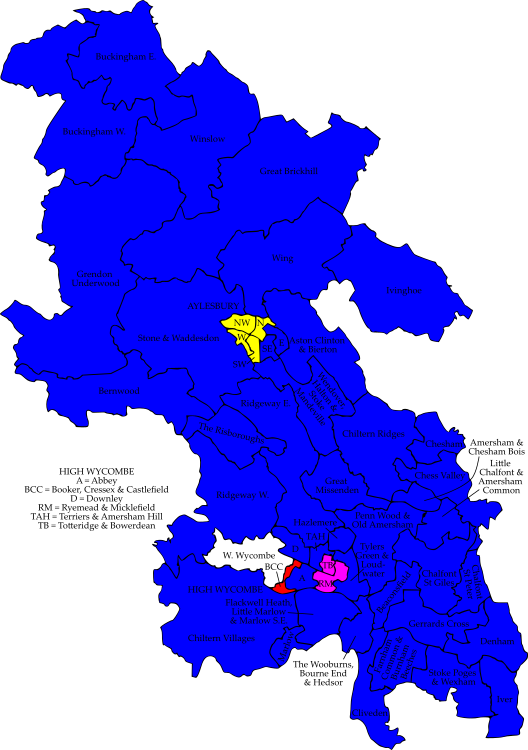 Shipley had been lost to the Conservatives in 2005, and in the 2010 election Labour also lost Keighley to the Conservatives and Bradford East to the Liberal Democrats. The fact that the Lib Dems could ever win that seat astonishes your columnist even now. It was a close three-way result with the Tories on 27%, Labour’s Terry Rooney (outgoing MP for the predecessor seat of Bradford North) on 33% and the Lib Dems’ David Ward taking advantage of the split opposition and the party’s local government strength in the area to win with just 34% of the vote. On the same day the Liberal Democrats won three of the six Bradford city council wards in the seat. David Ward’s tenure in the Commons proved to be controversial; he was suspended from the parliamentary party for a time in 2013 for a series of anti-Semitic remarks, and even after being readmitted to the party continued to cause problems. (Compare and contrast with Naz Shah, Galloway’s successor as MP for Bradford West, who went through a similar controversy and appears to have learned lessons from it.) Ward lost Bradford East to Labour in the 2015 election, but wasn’t out of politics for long; he returned to elected office the following year as a Bradford city councillor for Bolton and Undercliffe ward. It seemed a good choice: this was normally a safe ward for the party and Ward increased the Lib Dem majority over Labour to 52-30. But there were more twists to tome. The Bradford East Lib Dems readopted David Ward as their candidate for the 2017 general election and were reportedly confident of a win; but his candidacy was vetoed by party leader Tim Farron. Ward stood as an independent, finishing a distant third with 8% of vote; but that was better than the official Lib Dem candidate who finished fifth with just 1.8% of the vote. A rather large drop that, 34% to 1.8% in just seven years. And then Ian Greenwood decided to make a political comeback, and got the Labour nomination for Bolton and Undercliffe in the 2018 Bradford elections. In the closest result since the current boundaries were introduced in 2004, Greenwood defeated the outgoing Lib Dem councillor Rachel Sunderland by 45% to 42%, a majority of just 90 votes. So, anything could happen here. Defending for Labour is local resident Amriz Hussain. The Liberal Democrats have reselected Rachel Sunderland, the councillor whom Greenwood defeated last year; Sunderland was first elected in 2014 and his hoping to make a quick return to the council. Also standing are Ranbir Singh for the Conservatives and Phil Worsnop for the Green Party.